News — ICS Construction Services, Ltd.
ICS Construction Services, Ltd. completed this new ground-up, 15,000 square foot, one (1) story early childhood center in late October. The new facility consists of classrooms, a multi-purpose room and cafeteria space for children as young as six weeks old, while offering before and after-school care space for students up to the age of 12. According to The Morgan School, they "passionately believe in the value of education, and the importance of treating children with compassion and encouragement. Children at The Morgan School are given opportunities to learn through experience and play, with many stimulating activities throughout the day." For more information click here. ICS Construction Services, Ltd. recently completed work on the Wentzville City Hall. The new $9 million facility is located adjacent to the Wentzville Police Department’s Law Enforcement Center at the intersection of Wentzville Parkway and Schroeder Creek Boulevard. A ribbon-cutting ceremony and open house took place on November 8, 2017 and the facility opened for business the following day. The new central location is customer focused, allowing residents to pay utility bills, apply for permits, visit Municipal Court, and attend a Board of Aldermen meeting all at one location. ICS Construction Services, Ltd. completed this new ground-up, 101,000 square foot, one (1) story elementary school in early August. The project came in a week early on the base contract, and 4 months ahead of schedule on the north classroom wing. The new plan consists of general, special education, art & music classrooms, a full size gymnasium, multi-purpose room for cafeteria and secondary gymnasium, kitchen & serving areas, general storage, mechanical & electrical rooms, data rooms, offices and restrooms. For more information click here. ICS Construction Services, Ltd. recently completed work on the Ladue FD House #1. The new $3 million project replaced the existing fire house dating to the 1950s. The new fire house is approximately 24% larger than the previous fire house; with increased capacity in the apparatus bay, living quarters and restroom facilities. ICS Construction Services, Ltd. recently completed work on the Fort Zumwalt School District's new $5 million Early Childhood Center. 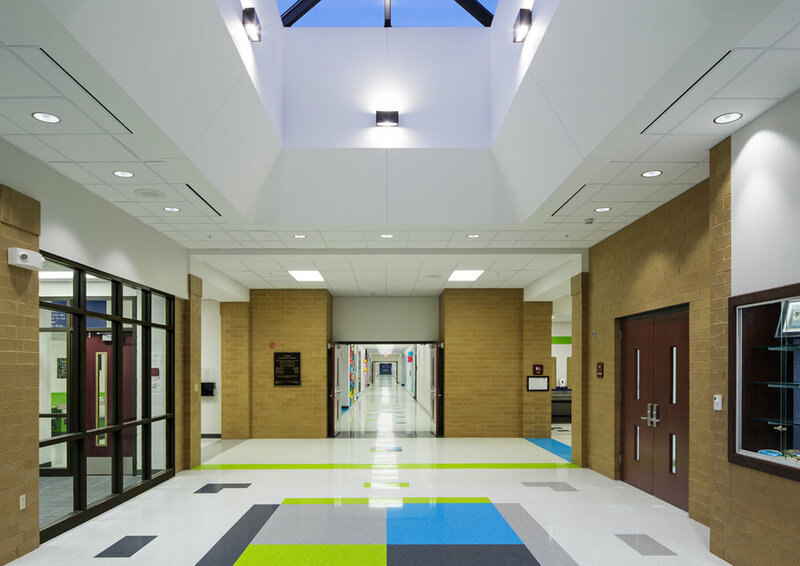 The 71,000 square foot existing building was completely gutted and transformed into educational spaces to accomodate 800 children ages 3 to 5 years old as well as 60 teachers and specialists. For more information click here. ICS Construction Services, Ltd. recently completed work on the Maryland Heights FPD House #2. The new $4.9 million project replaced the existing fire house dating to 1972; creating more capacity in the apparatus bays, improved operational areas, increased space in essential disaster storage areas and the addition of a dedicated medical assessment/treatment room, gender-friendly living areas and a community outreach center. ICS Construction Services, Ltd is set to start work on a new City Hall Complex for the City of Glendale in mid June. The $6 Million project will consist of renovating the existing city hall building to house city offices and the city's police station, and the construction of a new fire house just south of the existing city hall. ICS Construction Services, Ltd. recently completed work on a new $1.7 million building for the Field House Museum in downtown St Louis. The 4,000 square foot addition to the original 1845 row house includes new gallery space as well as a research library to house the collections and personal artifacts of the noted children's author Eugene’s Field and his father Roswell M. Field. Roswell served as the attorney who took Dred Scott’s freedom suit into the Federal Courts, leading to the infamous Supreme Court decision in Scott v. Sandford. For more information on the museum, please click here. 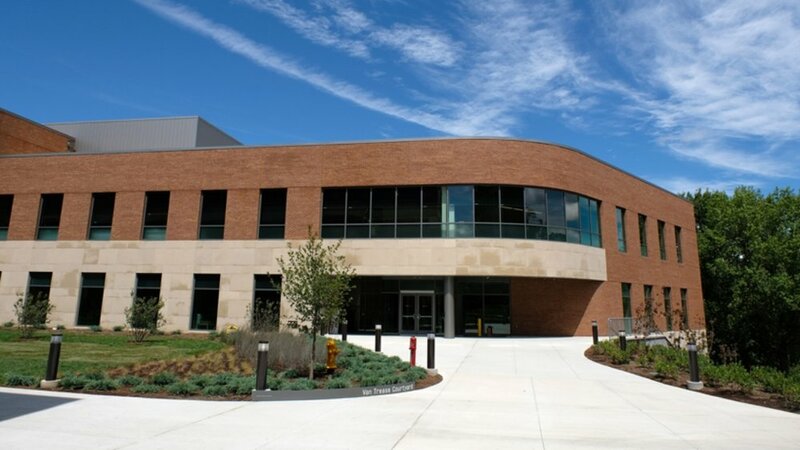 ICS Construction Services, Ltd. recently completed work on a new $15.3 Million building for UMSL’s College of Optometry. The 35,000 square foot Patient Care Center offers an open floor plan, an abundance of natural light, and state-of-the-art clinical space for adult and pediatric eye care services. ICS was proud to partner with UMSL on this important addition to their campus. For more information on the project, please click here. Construction progress at Golden Gate Elementary School in Wentzville MO was documented by a drone on December 9th of this year. ICS Construction Services, Ltd started work on this $18 Million project in June of this year. According to the Wentzville School District, Golden Gate Elementary will be the eleventh elementary school in the Wentzville School District, and the eleventh school built in the WSD since 2000. The WSD continues to be the fastest growing district in the state, adding on average between 500 and 600 new students each year since 2001. This is the second project that ICS has worked on with the district. Last year, ICS began work on classroom and gym additions at the district’s Liberty High School. Video images courtesy of Patrick Mace. ICS Construction Services, Ltd. recently completed work on a new classroom wing and gym addition at Liberty High School. The $8.5 Million project included the addition of 27 new classrooms, including science labs and art studios, as well as a new all purpose gymnasium addition. The Wentzville School District continues to be the fastest growing district in the State of Missouri, adding between 500 and 600 new students each year since 2001. ICS Construction Services, Ltd is set to start work on a new Early Childhood Center for the Fort Zumwalt School District in early December. The $5 Million project will consist of renovating a building formerly occupied by Sanford-Brown College and Le Cordon Bleu College. This will be the districts first Early Childhood Center, and will serve 800 students ages 3-5 years old when it opens in the fall of 2017. For more information on the project, click here. ICS Construction Services, Ltd. recently completed work on the Jefferson National Park Association’s new museum store at the Jefferson National Expansion Memorial in downtown St Louis. The new store serves as the JNPA’s store for the Gateway Arch. According to the JNPA, the store “generates revenue that helps ensure a rich educational experience for the millions of annual visitors who come to this park.” The products sold at the Arch store commemorate the history of the nation’s westward expansion, the early days of St. Louis, and the design and construction of the Gateway Arch. ICS Construction Services, Ltd. was proud to serve as the contractor on this important project at one of America’s most iconic National Monuments. For more information on the store click here. ICS Construction Services, Ltd. recently broke ground on the Ladue Fire House #1. The new fire house will replace the current fire house that dated from the 1950s. Once complete, the new fire house will be approximately 24% larger than the current fire house; increasing capacity in the apparatus bay, living quarters and restroom facilities. ICS Construction Services, Ltd. recently completed work at the Missouri Athletic Club West. This $1.4 million project consisted of the renovation of the club lobby and main dining room as well as the construction of a bar and patio addition. According to the MAC, the new "1903 Bar" was named after the Missouri Athletic Club's founding year, and was constructed to create an adult space for members to grab a drink, celebrate a special occasion, or entertain clients. The bar features, rich woodwork, multiple TVs, and two private alcoves that seat up to 12 people, as well as an outside patio that includes a fireplace and additional seating. ICS is proud to have partnered with the MAC on this important addition to their West Clubhouse. ICS Construction Services, Ltd. recently broke ground on the Wentzville School District’s Golden Gate Elementary. According to the Wentzville School District, the new $18.2 million project will be the eleventh elementary school in the Wentzville School District, and the eleventh school built in the WSD since 2000. The WSD continues to be the fastest growing district in the state, adding on average between 500 and 600 new students each year since 2001. This will be the second project that ICS has worked on with the district. Last year, ICS began work on classroom and gym additions at the district’s Liberty High School. For more information on the project click here. ICS subcontractor, Westport Pools, recently won a coveted Amenity Pool award in United Aqua Group’s 2016 Awards of Distinction competition for their work on our project at the North County Recreation Complex Pool at the Veterans Memorial Park. The project consisted of upgrades to the existing locker rooms and the replacement of an existing 50 meter pool with a new leisure/amenity pool. According to United Aqua Group, “the winners this year exemplified the best in pool design and construction”. For more information on the Award of Distinction for the North County Recreation Complex Pool, click here.